When the moku hanga workshop was canceled at Zea Mays Printmaking and director Liz Chalfin asked me if I'd like to work privately with a couple of the students who had signed up, I jumped at the chance. My experience has been that the people who attend Zea Mays workshops are usually practicing artists, many of whom have already had some printmaking experience, and are really fun to work with. Wendy and Martha were two such people. The three days followed the three basic stages of making a print, with the first day being devoted to design and color separation, the second day all about carving, and day three dedicated to printing. As anyone who has made a moku hanga style print knows, that's a whole lot to cram into three days, so it was a full-on experience with barely enough time to grab some lunch. Working with Wendy and Martha confirmed for me that there are a lot of ways to make a print. 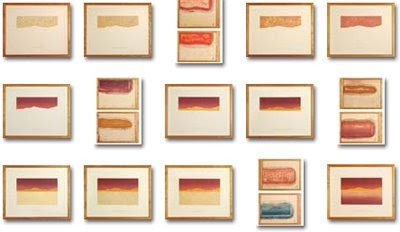 Each approached moku hanga in their own way and allowed the process to guide them as they became accustomed to all the variables involved -- the amount of paste, water and pigment, the personality of each wooden plate, the effects of baren pressure, the interactions of colors as they build. Artist and sheep farmer Wendy Ketchum of New Hampshire worked with a very graphic image she had developed of nasturtium flowers and leaves. Her plans for color seemed to work right off the bat, so once she had pulled a few proofs, her task was to refine her four blocks rather than focus a lot on color balance. She left with a small edition of proofs that she plans to continue to refine back home in her studio. Painter/printmaker Martha Ebner of Rust Avenue Studios in Northampton worked with a landscape design of a heron and a bridge. It was a challenging design for a single day of carving -- she used 5 blocks for 7 basic color areas. She was disappointed with the colors she chose for her first set of proofs, which drove her to drop her plans and begin experimenting. She began working with more painterly approaches, adding some bokashi (gradations), and ended up with a varied group of proof prints that she will take back to her studio and continue to work with. Ty the yellow lab loved having a workshop here in our home. It's a good thing Wendy and Martha both like dogs, because Ty insisted on being right where the action was! Many thanks to Wendy and Martha for a fun and jam-packed three days. The four-day moku hanga workshop I was scheduled to teach at Zea Mays Printmaking in Florence MA was canceled because of under-enrollment (we needed 5 participants). I was disappointed, but not too surprised given the economy. Luckily, though, two of the people who had signed up for Zea Mays wanted to work with me privately, so I'm preparing today for a three-day workshop that will be held here in my home studio. I'm excited about this and am preparing the studio today -- clearing out my piles of in-process projects and making space for my two guests. The workshop will be tomorrow (Thursday) through Saturday. I'll post some photos along the way. The shot on the left is the original "final" version. The first thing I did was darken her hair considerably. Then I added some green to the water around the figure. I also darkened the folds in her clothing along her back and on her breast and arms. Those four new impressions are reflected in the photo on the right. In the initial version, there had been no block for her dress, just the white of the paper, so I cut a new block in the shape of her dress. I then printed the dress shape in a bright white. You can see in the comparison photos above that the white layer gives her dress a milky diaphanous quality and smooths out the goma zuri (speckles) from the previous printing. Now I was getting close! Finally, I did some spot painting on the dress-shaped block to bring out some highlights on the forward-facing parts of the dress. Above is a closeup of that layer of printing. This cool 16-minute instructional video from 1968 came through my Google alerts this morning via Crosseyed Cyclops. It shows woodblock artist Lowell Naeve (American, born 1917) developing a multi-colored print from start to finish. Naeve prints western style in that he uses oil-based inks, but he hand burnishes with a wooden rice paddle, mixes his own pigments and uses Japanese paper. There isn't a lot of info about Naeve online, but apparently he lived in Vermont. Some discussion about him can be found on this page of the Just Seeds blog. Keiji Shinohara, a master woodblock printer who lives in Connecticut and teaches his craft at Wesleyan University, currently has an exhibit on view at Johnson Center for the arts in Troy, Alabama. Happily, the works can be seen online as well. The intent of the Alabama exhibit is educational as well as aesthetic, to "create a series of works that would visually document the distinctive process of Japanese woodblock printing." To this end, one of the prints is shown with each of the blocks used to create it as well as examples of the successive printing steps. Keiji Shinohara is also author of one of the best demonstrations of traditional ukiyo-e printing methods on the internet, the Wesleyan Ukiyo-e Techniques site. I'm still thinking hard about my career and wrestling with where to go from here. Freelance illustration has been slow, gallery sales are slow, and the mood among my colleagues in both arenas is fairly gloomy. What I know from past slow periods is that now is the time to focus on marketing, to experiment with new work, to redesign web sites and reach out to past clients as well as potential new ones. All of which can be difficult to do when one is nervous or scared or gloomy. But boy did I just get a lift! Last week a copy of the newly released book The Artist's Guide: How to Make a Living Doing What You Love arrived in my mailbox just as I was leaving for my four-day vacation, and I've been devouring it. 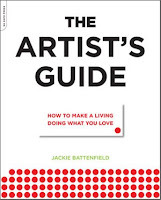 Author Jackie Battenfield is a successful artist herself, has owned and run a gallery, and teaches business development courses and workshops specifically for artists. First, a word of warning. Do not purchase this book if you're fond of making excuses for why you aren't a successful artist, because once you read it you will have no excuses left. Battenfield covers everything from examining your own hopes and fears to writing an artist statement to finding a place to show to securing funds. With real life examples and interviews scattered throughout, this book is 345 pages of pure career-coaching gold. The tone is positive and upbeat, yet realistic. Battenfield is very clear that being successful in the arts is a difficult task that takes a tremendous amount of work and perseverance, yet she demonstrates both that it is possible and how it is possible. In an act of great generosity Battenfield has withheld nothing, so the book reads like a precious tome of secrets. I still have two more chapters to read, but already I feel invigorated and inspired. I've made a list of short-term and long-term goals, have ordered some self-promo cards, have revamped my web site, and have had a good conversation with my gallery. What I also know is that this book is one I will turn to again and again, as the huge amount of information could easily take years to fully implement as my career evolves. Readers of this blog may also want to check out Battenfield's lovely large-scale woodblock prints!